Our licensed electricians perform many different kinds of electrical remodeling work for our customers. Especially with electrical work, it is important that things be done right and up to code. There are too many people out there doing electrical remodeling work that shouldn’t be, and your home is too important to take a chance with low-quality and shoddy work. At Cornerstone, we don’t cut corners. We do things the right way to ensure that your project gets done to your specifications, while ensuring your safety for years to come. Lighting can be one of the most important electrical items in your home. Ceiling fixtures, wall sconces, above cabinet lighting, under-cabinet lighting, or lighting inside of cabinets all bring more life to the interior of your home. Adding a dimmer switch to under-cabinet lighting for instance, can create an effect of some warm lighting in the evening that makes your house feel more like a home. Having the proper switches to work those lights is equally important. Besides lighting, installing ceiling fans, or changing the color on outlets and switches to blend in better with paint colors or tile backsplash selections. 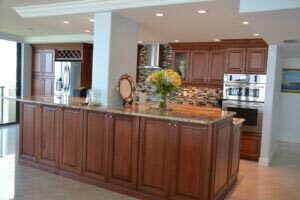 We’ll make sure that you have the proper electrical for your new appliances or for the new entertainment unit that we can custom-build for you. Rather than having to find your own electrician to do these items, we take care of it in-house for you so it is integrated right into the rest of the home remodeling project. Whatever your electrical needs are for your home remodeling project, we take care of them without you having to give them a second thought.